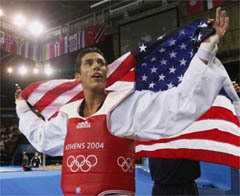 Steven Lopez of the United States winning the gold medal against Bahri Tanrikulu of Turkey in the men's under 80 kg Taekwondo gold medal match on Aug. 28, 2004. ATHENS, Greece — China and the United States grabbed one gold medal each in the taekwondo competition of the 2004 Athens Olympics here Aug. 28, 2004. China's Luo Wei defeated Elisavet Mystakidou of Greece on points 7-6 in the women's under 67kg-class final to clinch the gold medal. The bronze in the women's category went to Korea's Hwang Kyung-sun when she crushed Guatemala's Heidy Juarez on points 5-2 in the repechage final. In the men's under 80kg final, the United States' Steven Lopez, the reigning Olympic champion, brushed aside the stiff challenge from Turkish Bahri Tanrikulu to clinch the gold medal on points 3-0. Iran's Yossef Karami won the bronze medal in the men's division when he outpointed Azerbaijan's Rashad Ahmadov 9-8. Elisavet Mystakidou of Greece (left) fights Wei Luo of China in the women's under 67 kg Taekwondo gold medal match on Aug. 28, 2004. Wei Luo clinched the gold medal on the day. Jacques Rogge, president of the International Olympic Committee, visited the Sports Pavilion, the venue of Taekwondo competition, around 4 p.m. to watch taekwondo matches for about 50 minutes along with Choue Chung-won, new president of the World Taekwondo Federation. Two gold medals are also at stake in the taekwondo competition tomorrow (Aug. 29).